There some great films in the history of cinema that have made movie itself as its theme. The famous ones include Wim Wender’s “Kings of the Road”, Abbas Kiarostami’s “Close-up”, Billy Wilder’s “Sunset Boulevard” and perhaps the most popular foreign film being “Cinema Paradiso”. 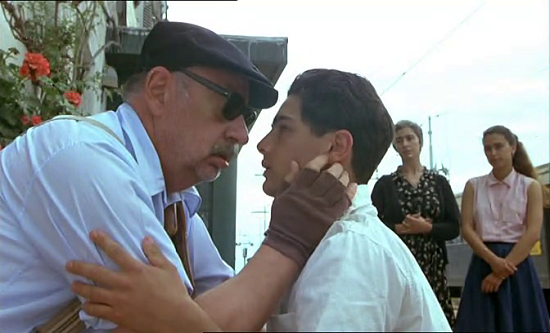 If you love movies, it's impossible not to appreciate Cinema Paradiso, Giuseppe Tornatore's heartwarming, nostalgic look at one man's love affair with film, and the story of a very special friendship. Affecting (but not cloying) and sentimental (but not sappy), Cinema Paradiso is the kind of motion picture that can brighten up a gloomy day and bring a smile to the lips of the most taciturn individual. Light and romantic, this fantasy is tinged with just enough realism to make us believe in its magic, even as we are enraptured by its spell. The mark of a truly classic film is that its themes and subject matter are timeless, relatable to each successive generation even if the direct circumstances have passed. Cinema Paradiso falls perfectly into that mold. Cinema Paradiso is perhaps cinema’s greatest ode to motion pictures, and such could not be more accurate. The story of the little Toto, told from the perspective of the grown and successful Salvatore as he recalls his own childhood, is a bewitching tale of every human emotion imaginable – sorrow, bliss, laughter, compassion, rage, desperation and loss, teaching, learning, dreaming and hoping. The director captivate each intangible in its most perfect essence. Cinema Paradiso is an unforgettable experience which leaves you forever changed. 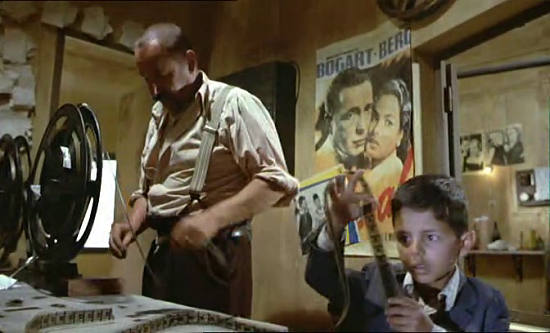 Most of Cinema Paradiso is told through flashbacks. As the film opens, we meet Salvatore (Jacques Perrin), a famous director, who has just received the news that an old friend has died. Before departing for his home village of Giancaldo the next morning to attend the funeral, he reminisces about his childhood and adolescence, thinking back to places and people he hasn't seen for decades. As a fatherless child, Salvatore (Salvatore Cascio) loved the movies. He would abscond with the milk money to buy admission to a matinee showing at the local theater, a small place called the Cinema Paradiso. Raised on an eclectic fare that included offerings from such diverse sources as Akira Kurosawa, Jean Renoir, John Wayne, and Charlie Chaplin, Salvatore grew to appreciate all kinds of film. The Paradiso became his home, and the movies, his parents. Eventually, he developed a friendship with the projectionist, Alfredo (Philippe Noiret), a lively middle-aged man who offered advice on life, romance, and how to run a movie theater. Salvatore worked as Alfredo's unpaid apprentice until the day the Paradiso burned down. When a new cinema was erected on the same site, an adolescent Salvatore (Marco Leonardi) became the projectionist. But Alfredo, now blind because of injuries sustained in the fire, remained in the background, filling the role of confidante and mentor to the boy he loved like a son. 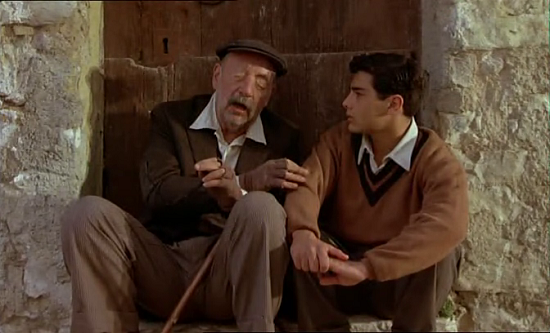 Cinema Paradiso's first half, with Salvatore Cascio playing the young protagonist, is the superior portion. The boy's experiences in the theater, watching movies and listening to Alfredo's stories, form a kind of journey of discovery. As Salvatore cultivates his love of movies, those in the audience are prodded to recall the personal meaning of film. It's an evocative and powerful experience that will touch lovers of motion pictures more deeply than it will; casual movie-goers. Once Salvatore has grown into his teens, Cinema Paradiso shifts from being a nostalgic celebration of movies to a traditional coming-of-age drama, complete with romantic disappointment and elation. 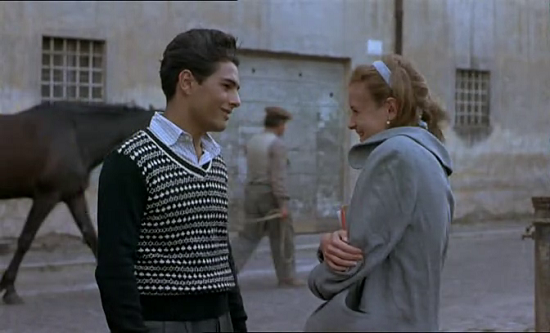 Salvatore falls for a girl named Elena (Agnese Nano), but his deeply-felt passion isn't reciprocated. So he agonizes over the situation, seeks out Alfredo's advice and then makes a bold decision: he will stand outside of Elena's window every night until she relents. In the end, love wins out, but Salvatore's joy is eventually replaced by sadness as Elena vanishes forever from his life. The Screen Kiss is important to Cinema Paradiso. 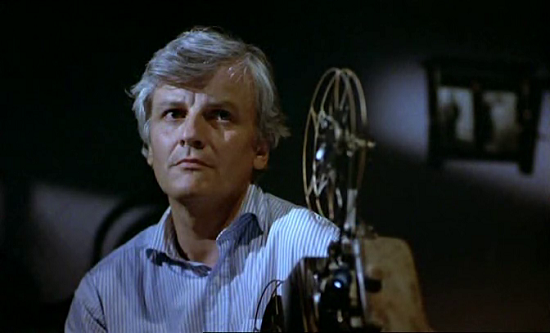 Early in the film, the local priest previews each movie before it is available for public consumption, using the power of his office to demand that all scenes of kissing be edited out. By the time the new Paradiso opens, however, things have changed. The priest no longer goes to the movies and kisses aren't censored. 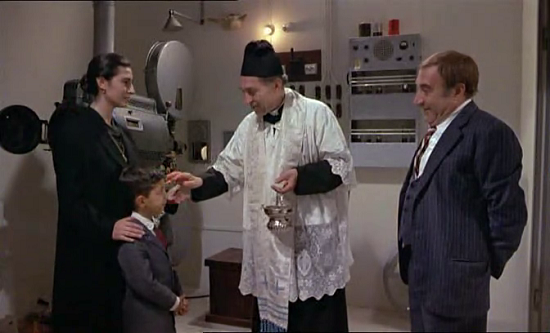 Much later, following the funeral near the end of Cinema Paradiso, Salvatore receives his bequest from Alfredo: a film reel containing all of the kisses removed from the movies shown at the Paradiso over the years. It's perhaps the greatest montage of motion picture kisses ever assembled, and, as Salvatore watches it, tears come to his eyes. The deluge of concentrated ardor acts as a forceful reminder of the simple-yet-profound passion that has been absent from his life since he lost touch with his one true love, Elena. It's a profoundly moving moment - one of many that Cinema Paradiso offers. Is Cinema Paradiso manipulative? 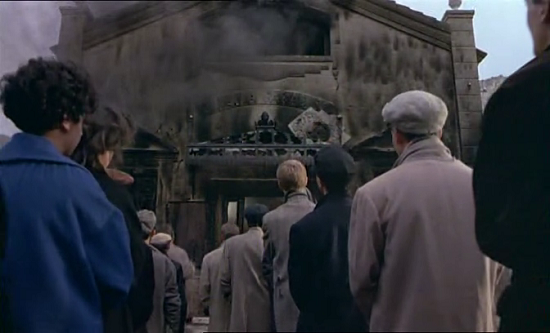 Manifestly so, but Tornatore displays such skill in the way he excites our emotions that we don't care. This film is sometimes funny, sometimes joyful, and sometimes poignant, but it's always warm, wonderful, and satisfying. Cinema Paradiso affects us on many levels, but its strongest connection is with our memories. We relate to Salvatore's story not just because he's a likable character, but because we relive our own childhood movie experiences through him. Who doesn't remember the first time they sat in a theater, eagerly awaiting the lights to dim? There has always been a certain magic associated with the simple act of projecting a movie on a screen. Tornatore taps into this mystique, and that, more than anything else, is why Cinema Paradiso is a great motion picture. The movie won countless awards, including the Oscar for best foreign film and multiple BAFTAs. The casts’ performances are moving across the board, while Ennio Morricone’s score is delightful. The cinematography and production design are absolutely beautiful. It is a truly a film in which every element works in harmony to create a perfect whole. 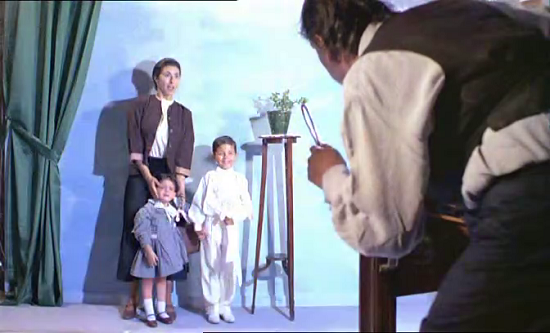 Thoughts about the "Director's Cut": When Cinema Paradiso was released in the late 1980s, the version seen by Italian movie-goers was much different than the cut shown to North American viewers. 51 minutes were sliced and diced from the U.S. release. The truncated edition is still a stunning, masterful production, but it leaves the audience with a nagging question: What really happened to Elena? The answer is provided in a 35-minute sequence that never made it into the 1988 American release, but which has now been restored. Of the 51 "new" minutes of footage, most comes near the end, although several relatively inconsequential scenes have been re-inserted into the main story (one of which shows Salvatore losing his virginity). 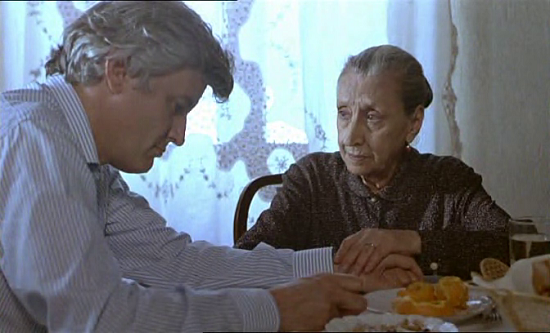 In the shorter version, Alfredo's funeral functions as an epilogue. In the director's cut, it's a full third act that gives closure to Salvatore and Elena's story and provides us with a more complete picture of Salvatore's mentor. Rather than slowing down Cinema Paradiso's pace, this footage enhances the film's poignance and power, elevating it to a loftier level than the rarified one attained by the first cut. 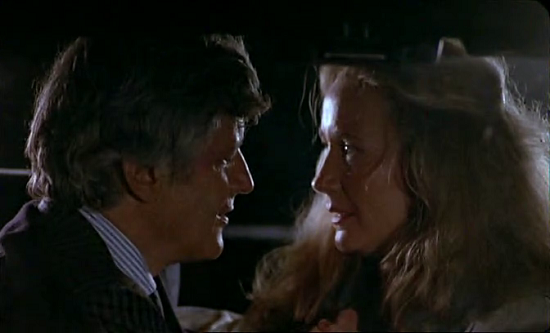 And, viewed after this new material, the Screen Kiss montage is even more touching and transcendent. For lovers of Cinema Paradiso, widely regarded as one of the best foreign language films ever to grace American screens, this restored version is unquestionably a "must see". The magic and poetry of the original remain, but the added scenes fashion a different, more complete cinematic experience. The main theme song by the fabulous Ennio Morricone, the sweet slow longing sound of violin and cello, no doubt will play in your ears forever. The closing scene is one of the best in the movie as the director leaves it up to the audience to decide whether personal happiness or the creation of great art is more important. In summation, Cinema Paradiso truly remains an ode to the magic of movies.